* Illustrates the application of the PEM technique in various areas of device reliability, in particular hot-carrier, oxide and ESD reliability. * Provides an analysis of light emission in semiconductors under hot-carrier and high-field impulse stressing in MOS transistors and photon emission from biased MOS capacitors. Not only an essential reference for researchers and students in the field, the numerous practical examples throughout the text also make this an indispensible guide for failure analysis engineers and microelectrics industry professionals. Introduction; Instrumentation - The Photon Emission Microscope; Design of a Photon Emission Microscope for Spectroscopic Analysis; Characterization of Photon Emission Spectra Under Different Device Bias Conditions; Photon Emission from Metal-Oxide-Semiconductor Field-Effect Transistors (MOSFETs) under Hot-Carrier Stressing; Photon Emisson from MOSFETs under High-Field Impulse Stressing; Photon Emission from Metal-Oxide-Semiconductor (MOS) Capacitor Structures; Index. 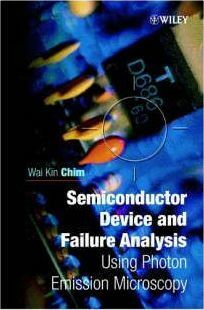 Wai Kin Chim is the author of Semiconductor Device and Failure Analysis: Using Photon Emission Microscopy, published by Wiley.